Putting this card together could not have been easier. The Memory Box dies are a dream to cut and fit together perfectly. I used a bit of enamel paint for the handles of the sideboard. The tiny tea set from Waltzingmouse Stamps is the perfect scale for this little scene! The sentiment banner was printed (Black Jack font) and die cut with my new Die-namics Fishtail Flags Stax from MFT. The rolled felt flower is from my lovely friend (and awesome cardmaker) Jeanne. I love how sweet this little card turned out! The only thing I would change is to use embossing powder for the tea set (so that the pattern doesn't bleed through). I hope everyone has a fantastic week! Thanks for taking a peek! Wow, so adorable. So clever. JJ this is so sweet - I love what you do with that window die! It looks great as a little cabinet complete with little handles! 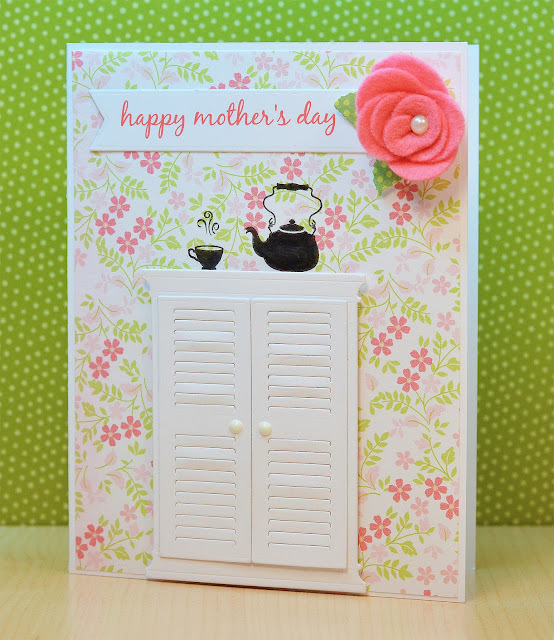 The pretty background, the tea set, and the felt flower make this a real beauty for mom! I love it! Love it. The little handles, the amazing detail on the shutters, the perfect fabby rose accent...polka dot leaves? Every element is perfect. So very clever! Love it. This is SO gorgeous! Love those perfect louvered doors and the little enamel knobs. So so sweet! :) Hope your week is off to a wonderful start! What a wonderful little scene you have set up here. Just peaceful and darling, and perfect for mother's day. I said it once and I will say it again, you create a scene that is so real, it's just amazing. You did it again. I think Memory Box needs to hire you! Such a lovely sweet card, I love the die cut door, and the WMS tea pot! Lovely! Such a beautiful card, I love that you used that die to make a cabinet! you amaze me with the way to use your dies.this is so pretty!